If there’s been one constant in Borussia Dortmund’s defensive setup over the last few seasons, it has to be the presence of Sokratis Papastathopoulos. The Greek defender has found a home at the Signal Iduna Park on his quest to become one of the best centre-backs in the world. bundesliga.com discovers everything that makes this colossal defender such a unique character. The 2006/07 season was the Greek defender’s first campaign in the AEK Athens first-team squad. Although he was only 18 at the time, Sokratis made the most of his opportunities to establish himself as a first-choice centre-back. Most memorably, he managed to neutralise that year’s Champions League winners AC Milan to aid his side in a famous 1-0 victory. The following season, he was recognised as his country’s best young player, which prompted Italian side Genoa to cross the Adriatic in search of his signature. As far as mythical midfield duos goes, the partnership between Gennaro Gattuso and Andrea Pirlo at AC Milan is one of the most godly pairings. For a brief period of time, Sokratis had the privilege of playing behind these two absolute titans. Having an impressive two seasons at Genoa, the Rossoneri signed him for the 2010/11 season, where he was also teammates with the likes of Robinho and Zlatan Ibrahimovic. Although he got to collect a winners medal after his team clinched the Serie A title, he only made 5 league appearances and moved to Werder Bremen the following season. In his five seasons at the club, he has turned into a true leader with his solemn demeanor and resolute defensive performances. So much so that last season, on Matchday 6 against Bayer Leverkusen, the colossus of Kalamata was given the captain’s armband for the first time. In the current campaign, his leadership continues unchallenged after winning 68% of his duels, a figure which only three players in the entire league have been able to top. 4) What’s in a name? Footballers who go mainly by their first name are not a novelty. Although this convention is more common for Brazilian virtuosos, Sokratis has a very practical reason to forgo his surname on the field. Namely, the 16 characters in “Papastathopoulos” are too many for kit manufacturers to print on the back of jerseys. He’s scored at least one goal in every season he’s played in Germany, but never more than two. His very first Bundesliga goal was the opener in a 4-1 win for Werder Bremen over Wolfsburg in 2011. Considering his towering height, one would think that headers are his specialty, however, only four of his nine league goals have come off his forehead. Perhaps his most notable effort since arriving at the Signal Iduna Park in 2013 came last season against Eintracht Frankfurt, when the defender took a page from Marco Reus’ trick book. Dribbling his way from midfield to just outside the opposition's box, the agile beast opened space for a thunderbolt bound for the top corner, which left Lukas Hradecky with no chance. Watch: Sokratis' scorcher against Eintracht Frankfurt was one of the 3 best defender goals of the 2016/17 season. Footballers are famous for using their generous salaries on lavish toys for big boys. While Sokratis’ former teammate Pierre-Emerick Aubameyang made headlines by driving around in a chromed Lamborghini, the defender drew attention of his own from fans and the press for his choice in Italian automotive engineering for very different reasons. Shortly after signing for Dortmund, Sokratis surprised everyone by turning up to training in a modest Fiat 500. Both the relatively cheap price of the machine and the contrasting image of the towering defender in the driver’s seat of a compact two-door coupé made for a curious story that put the Greek in a very positive light with the fans. It was a refreshing change from the ostentatious lifestyle many footballers usually like to project. “It’s a great machine, perfect for the city, I’ve had it for over six years. It’s fun to drive around in such a nippy little car”, said Sokratis after the images went viral. Although Greece’s biggest triumph to date, winning the UEFA European Championships in 2004, came too early for Sokratis, he’s still managed to write himself into his national team’s history with a dramatic performance at the 2014 World Cup in Brazil. There, the Hellenic squad booked a place in the Round of 16 for the first time in their history and faced the tournament’s Central American Cinderella: Costa Rica. Greece were down 1-0 for most of the second half, but Sokratis pushed forward in the dying minutes of the game and managed to score an injury time equaliser to force extra-time. The European side eventually lost in a penalty shootout, but their heroics made waves across the world, especially after the squad contacted the country’s authorities to declare they would prefer to forgo their tournament bonus payment in order to finance the construction of a new training facility in Athens. 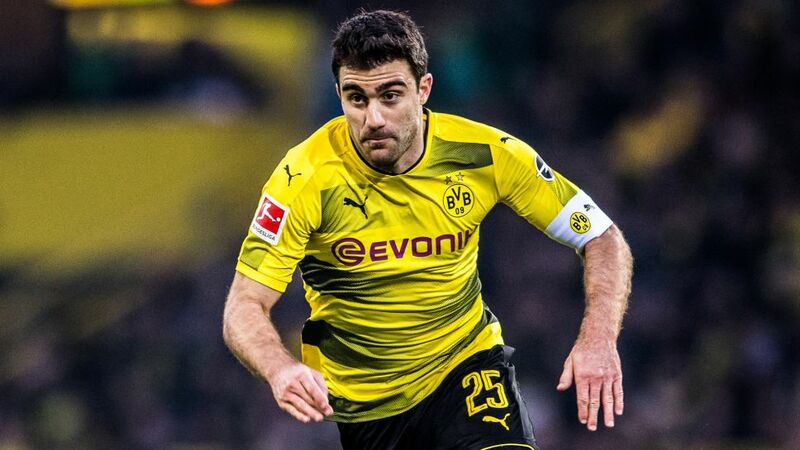 Since arriving in Dortmund in 2013, Sokratis has had four different coaches, all of which made him a cornerstone in their systems. Jürgen Klopp was his first boss at the Signal Iduna Park and the Greek made it no secret that the charismatic trainer was one of the main factors that drew him into the club. “He’s one of the best coaches in the world”, said Sokratis in one of his first press conferences as a Dortmund player. Next came Thomas Tuchel, who further refined the Greek by harnessing his aggression and pushing him to improve his offensive game. “He’s a little obsessed with defending. He wants to protect the goal-line no matter what and he’s hungry to face duels”, said Tuchel during his reign at Dortmund. Both Peter Bosz and Peter Stöger have kept Sokratis as the heart of the club’s defense this season and there’s no sign that won’t continue to be the case in the near future. Watch: Sokratis' top 5 tackles for Borussia Dortmund. Following their successful outing in Brazil, Greece knew that their road to the next World Cup wouldn’t be easy. What neither Sokratis nor his teammates anticipated was the kind of tactics some of their rivals would employ to stop them. In 2016, for example, Bosnian forward Edin Dzeko went to extreme lengths in order to slow down play. With the visitors leading 1-0, Dzeko was fouled by Sokratis and held the ball firmly in his grip. When the Greek defender tried to wrestle it away in order to restart play as soon as possible, the forward pulled down Sokratis’ shorts and forced him off his feet. Dzeko was swiftly expelled and, although Greece managed to equalise that game, they missed out on this summer's Russian date after losing to Croatia in a qualification play-off.